L.G. Vaughan & Sons is one of the oldest pest control companies in business, operating in Ireland over 80 years giving us an experienced and pragmatic outlook in our provision of service. 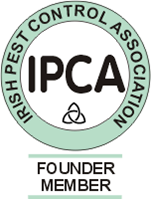 Throughout that period we have provided and continue to provide pest control services to businesses and companies throughout the country, constantly adapting to the technological advances within our industry and maintaining the highest working standards to ensure our customers have the highest quality pest prevention systems in place. We develop tailor made pest prevention services to fit the differing requirements of our customer. All work treatments carried out by experienced technicians, strictly employing H.A.C.C.P. guidelines in their work. All vehicles unmarked. We provide a unique proofing option preventing birds from roosting and nesting on buildings. This is a natural gel repellent which appears to birds as a flame and does not affect the aesthetics of the building. We supply & fit a Falcon Kite which is ideal for deterring seagulls, pigeons and several other species of birds on flat roofs, industrial roofs, car park decks, sports fields and harbours.